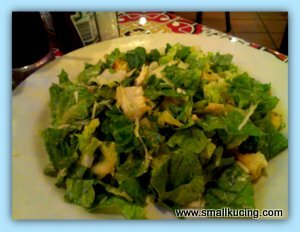 SMALL KUCING: Crazy About Salad at Chilis' , Citta Mall. 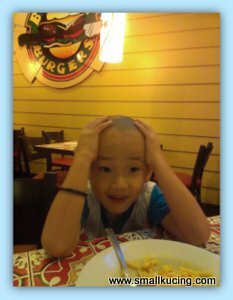 Again we went to Chili's. The other time, papa crazy about Caesar Salad and now Mamarazzi pulak Crazy about Caesar Salad. Argh....Brain freeze due to too much iced drink. Needless to say. Had their moo moo. Hmm...I like . Usually I seldom eat moo moo meat just like that but this round I had quite a few bites. Delicious. Huge plate of Caesar salad. Perfectly done! If not mistaken it's called Club Sandwich. Papa said good . Generous with the Chicken slices. But Mamarazzi said it was a bit soggy for her. Of course la..have to eat immediately mah. She wait till finish the moo moo then eat this. Not surprising it had turned soggy la. I had a try too. Mmm....not my slice of bread. I preferred my "noodles". Papa walloped all. a plateful of salad..I want that! Yes, yes... their salads are to die for. Very crunchy and fresh, and auntie likes their croutons the most! 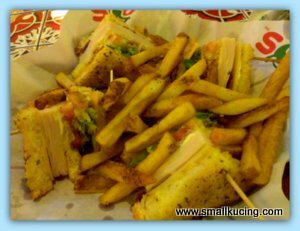 I want that chicken club sandwich and fries! LOL, the brain freeze is cute! Moooooo looks soooo good! aND i LOVE CLUB SANDWICHES TOO. nOM...NOM...NOM! 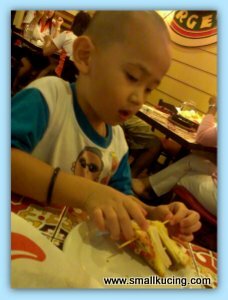 Hmmm...since your Mamarazzi and Paparazzi love the Caesar Salad so much, I must try it when I go to Chillis. I usually get the Crispy Chicken Salad. The dressing is nice. 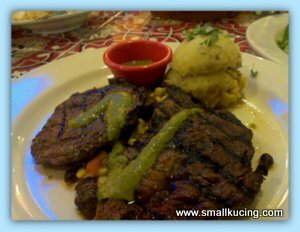 i like Chili's.. one thing is their portion, second is their bottomless juice.. and i also think their food are nice compared to its competitors..
but cannot order too much also lah because of the portion, haha!! usually will order the "Triple Play" for sharing, love the platter lah..
go with friends then can order a lot and share out . Wah! The Mommy sure banyak makan. Never had Chilli before. Saw from reviews their portion is very generous (and it's kinda scare me, because I'm a small eater) and worth the price. 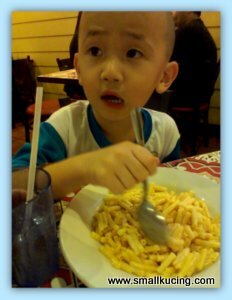 So SK ate macaroni - the noodle? Chilli is quite a nice place though I go there once a while. You sure did know what to choose from their menu. he is a good eater!